It’s a curious fact of the games industry that nearly all the best duelling games in existence were not intentionally designed that way. Jedi Outcast was primarily a single-player FPS, but its stunning lightsaber combat later spawned an online duelling scene. Chivalry: Medieval Warfare only introduced a duelling mode after the community clamoured for one to be included. Even Dark Souls didn’t let players fight each other in an organised fashion until the third game, which expanded the multiplayer in such a way that ad-hoc fighting arenas were created with rules and boundaries that were entirely player-governed. For Honor is probably the first game since Bushido Blade that has been deliberately designed as a duelling game, and it absolutely excels at it, sporting a deep, tactile combat system that produces fantastic one-on-one fights. This makes it all the more frustrating that For Honor spends so many of its resources pretending to be something else. The game’s gloriously silly premise pits Knights, Vikings, and Samurai against each other in a pseudo-fantasy world that’s less Sword and Sorcery and more Sword and Spear and Dagger and Axe and Sword and Shield and Sword. 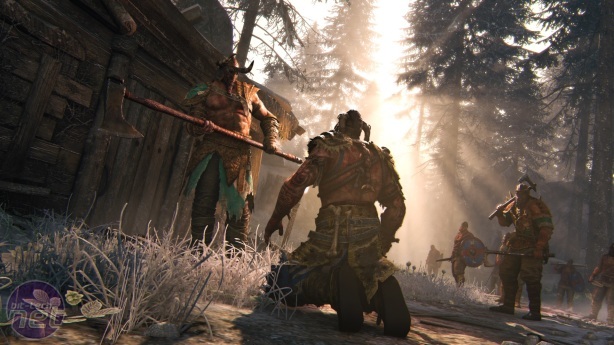 There’s a bunch of different ways to play the game in both multiplayer and single-player, but it all revolves around the same brutal, brilliant combat system. 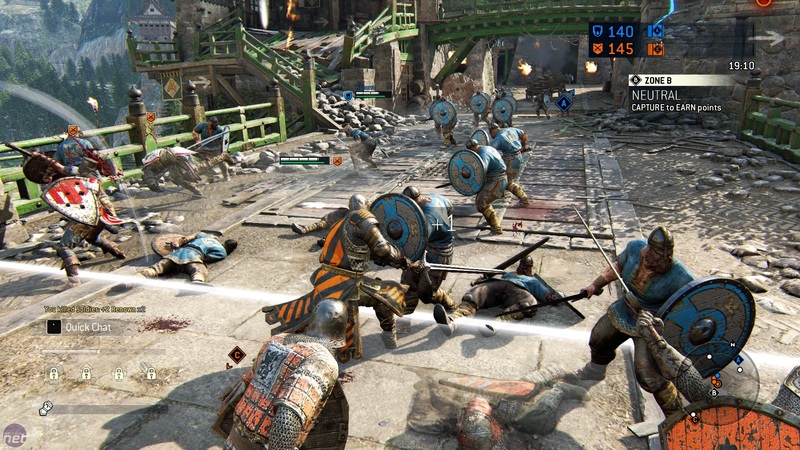 At a basic level, For Honor’s combat is a halfway house between a third-person hack-‘n’-slash and a more dedicated fighting game. You’re empowered with a speedy light attack and a slow but powerful heavy attack, and you can build combinations of these to enact a variety of devastating special moves. There are twelve classes of fighter across the three factions, each with its own unique weapon, abilities, and move-set. So far, so generic. Where For Honor becomes interesting is not in attack but in defence. 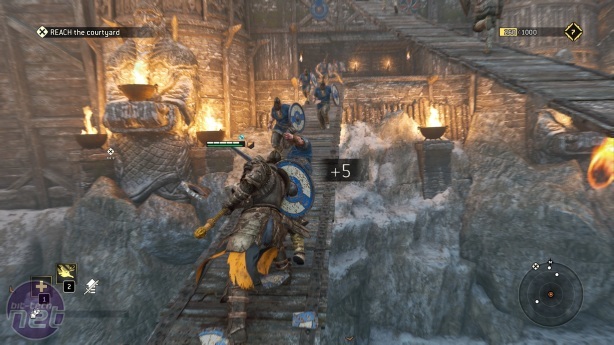 When you fight another player in For Honor, you sit in one of three 'guards', which approximate to left, right, and high guards. 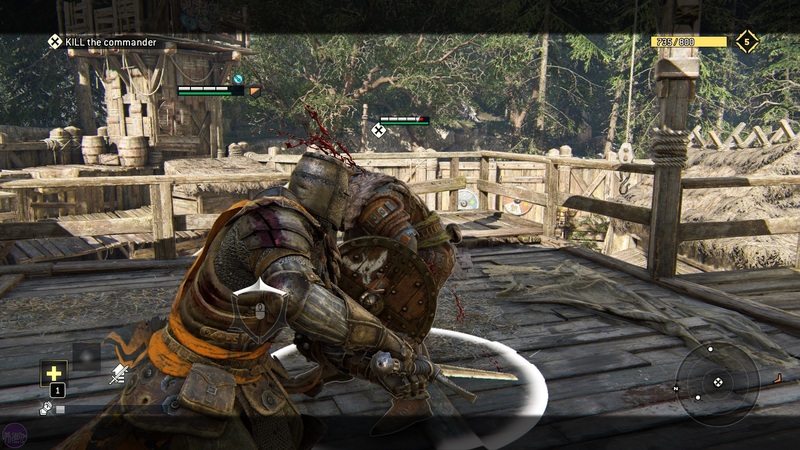 If the opposing player attacks you in the same direction of your guard, your character will block it automatically. What’s more, if you press the heavy-attack button at the right moment, you’ll deflect the blow entirely, leaving your opponent’s body briefly exposed. It’s a clever dilution of how the basics of melee combat work, with each fighter constantly trying to adjust to their opponent’s defensive position. Shifting your guard to defend an attack is simple in theory, but in practice can be tricky when combat is in full flow and you’re trying to land blows while anticipating those of your opponent. This is coupled with some excellent animation designed to divert your attention away from your guard and leave you exposed to attack. Absolver is a decent martial arts game wrapped in a framework that doesn't really fit.